We needed to turn this BORING room into a lively boy’s bedroom! Here is a photo I took when we toured the house. It was very plain and kind of boring. I knew it had potential. Even with those curtains. This home belonged to grandparents, so this was a room where kiddos only stayed sporadically. I could have tidied-up before taking the “after” picture. But that would have been a lie, ha! Here is real-life, my dears. 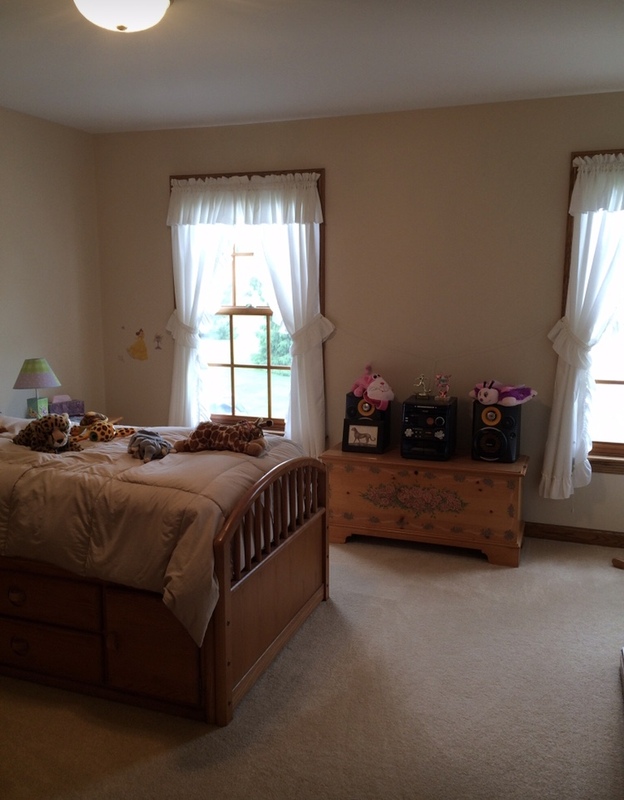 We painted the trim in white, but left the windows in wood to add warmth to the room. Light fixtures can change the feel of a space for very little money. We got him this fun STAR LIGHT FIXTURE to give the room a playful feel. The HOLA sign is from Feather and Birch and can be found HERE. Oh, and we replaced the curtains ;). We painted three walls in Naval by Sherwin Williams (my most favorite navy ever!) and did an accent wall in gray. I knew this wall needed something more. I wanted to create a space that would grow with him and still be cool years from now. So I whipped up some cool trees. He was thrilled with them and is hoping to have a Bigfoot peeking out from behind one soon. That is on my to-do list ;). We love his bedroom trees so much that they inspired this Copper Corners wallpaper named TRAILS. We wanted every boy (or girl) to have a modern yet fun room, inspired by nature! And with everything that I create, I aim for “timeless”. Trails works in a nursery, it works in a teen room, it works in an office. I purposefully created it to be contemporary with versatility in mind. If you are itching to update your space, you can find Trails HERE! Thank you for coming by! I hope you find much inspiration every time you click on our CopperCornersArt.com website. Also, we love being shared! If you think a friend or family might find our site helpful, send it their way! We always look forward to creating great spaces with you.